“FUN, LAUGHS AND GOOD TIMES” We take our audiences on a musical holiday ‘AROUND THE WORLD’ Costumes, Crowd participation, Sing-a-long Visit the USA, France, Exotic Latin America, England, Europe and surprise stopovers! The show incorporates a ‘holiday theme’. And it’s always nice to go on a holiday! Nessie and Mike are well known respected entertainers with a history covering musical theater, tribute shows, Rock ‘n Roll dances and TV appearances. 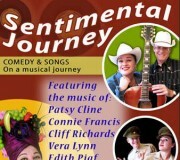 Sentimental Journey is about fun with the audience, colourful costumes, hit songs and crowd participation way beyond the usual daytime shows. Reminisce, participate and sing-a-long. 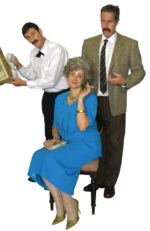 Sentimental Journey is well known at Melbourne venues such as the Manhattan and Doncaster Hotels, Mulgrave Country Club, RSL clubs, social clubs, Town Councils and functions. Perfect for Daytime Melody shows and also as a fully choreographed cabaret/variety act for corporate and nightclub functions shows. SOME SONGS FROM OUR SHOW!